As our summer weather starts getting warmer a hike along the beach can be a welcome alternative to hiking in the mountains. And this being Southern California we have a number of great beaches here to choose from. One such beach which affords one an opportunity to see a variety of scenery is located near Coal Oil Point Reserve. This also happens to be near the open space at Ellwood, which lets you craft a hike so that you can visit both the reserve and bluffs overlooking the beach. 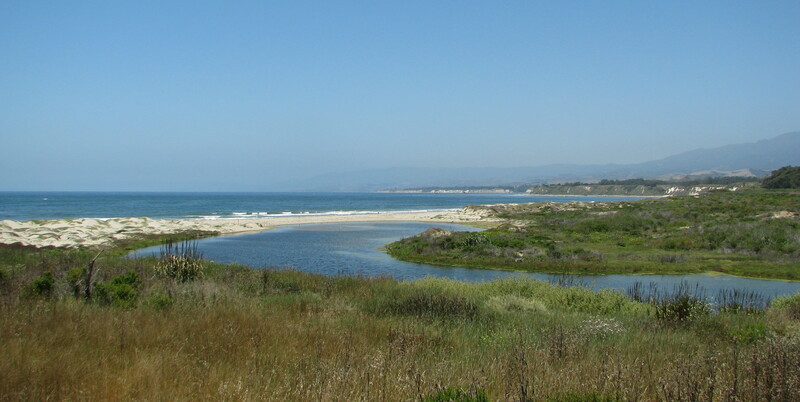 One such hike starts at Coal Oil Point, leads around the Devereux Slough and then along both the bluffs and beach, about 6 miles roundtrip. To get to the trailhead find your way to Del Playa Drive and Camino Majorca, which are found in the southwest corner of Isla Vista. Parking is found along the street. From the trailhead there is both immediate access to the beach and a trail that leads west along the bluff. Both meet up on the beach at Coal Oil Point a half mile later. The walk along the bluffs has been enhanced with recent trail improvements and so gone are the days of muddy or rutted trails through this section. At Coal Oil Point there are some sweeping views overlooking the ocean and the dunes at the mouth of Devereux Slough. At the point there’s also a mix of buildings as well as a trail leading down to the beach also known as Sands. It’s here that the 170 acre Coal Oil Point Nature Reserve begins. 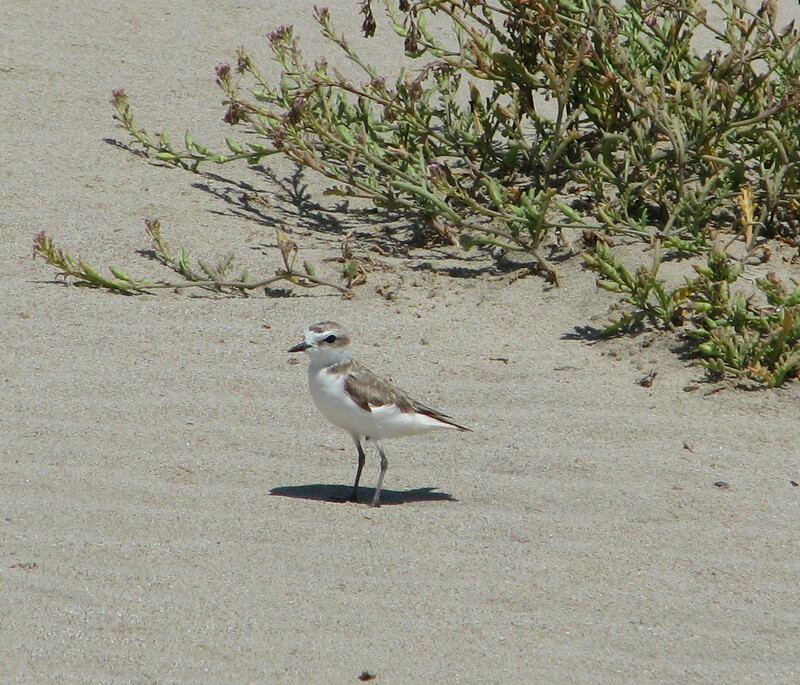 The reserve is home to the Western Snowy Plover and other rare or endangered species and is part of the University of California’s Nature Reserve system, which also includes the Sedgwick Reserve along Figueroa Mountain Road past Los Olivos. 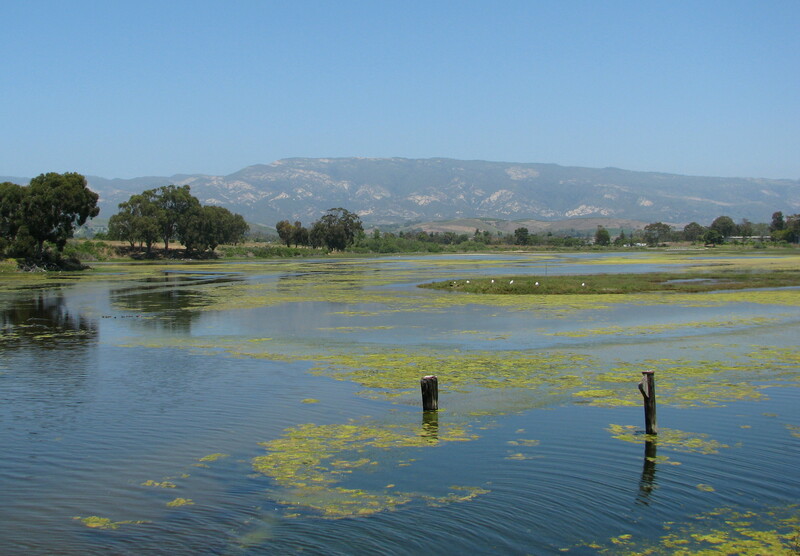 The main features of the reserve are the coastal dunes and Devereux Slough, which is a great place for bird watching. There are two main trails for Coal Oil Point Reserve, one that circumnavigates the reserve and one that bisects it, both lead around the slough. A map of the reserve can be found on the fence at the entrance to beach. To take the trail around Devereux Slough, from the fence at Coal Oil Point, backtrack just slightly around the buildings to catch the access road that leads north and connects to Slough Road. A half mile later the trail meets the Venoco access road and continues west around the slough. Just past the golf course you’ll find Pond Trail which bisects the reserve and continues the loop around the slough before heading off to the dunes. At about the 2 mile mark the Pond Trail crosses through the dunes and arrives back at the beach. This last part of the trail leads through the nesting area for the Western Snowy Plover. Please stay on the trail to protect this sensitive habitat. At the shoreline, if you look closely you may even see this little bird scurrying about. On the beach you’ll also discover why it’s called Coal Oil Point because of all the natural seepage. The tar that’s washed up along the beach was once used by Chumash along with pine pitch to seal their wood plank canoes or tomols that were used for travel between the coast and the Channel Islands. The tar is fairly easy to remove from one’s feet with a rag and vegetable or baby oil. From here continue west along the beach. One of the great things about beach hikes of course is it’s easy to stop for a swim and cool off. You’ll want to check the tides before going as one can make it furthest along the beach when the tides are going out. Along this next mile of the coast there are three separate trails leading up to the bluffs at Ellwood, which can make for an interesting return route. For additional hiking one can continue west along the beach, tides permitting, to the coastal access at the Bacara, about 4 additional miles round trip. There you’ll find a snack bar and restrooms. The hike back along the bluffs provides extra views of the coast and in the winter months the opportunity to see the Monarch Butterflies on their annual visit to the area. 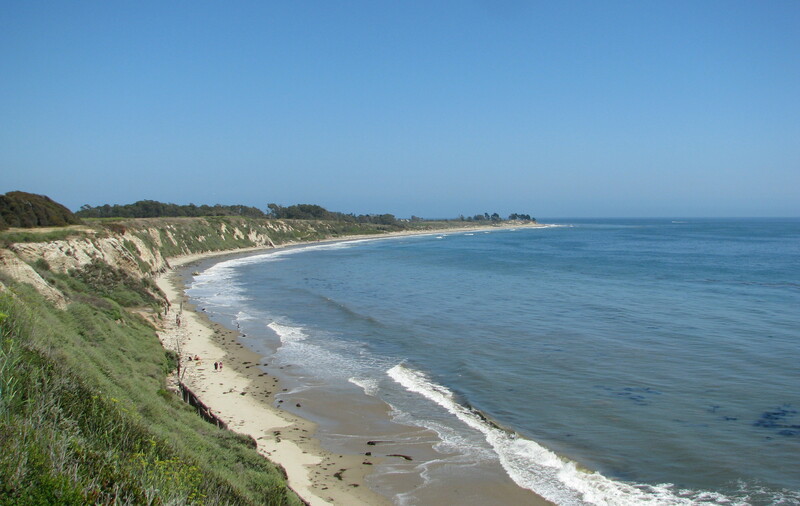 The bluffs are a large open space between the ocean and the residences at Ellwood. 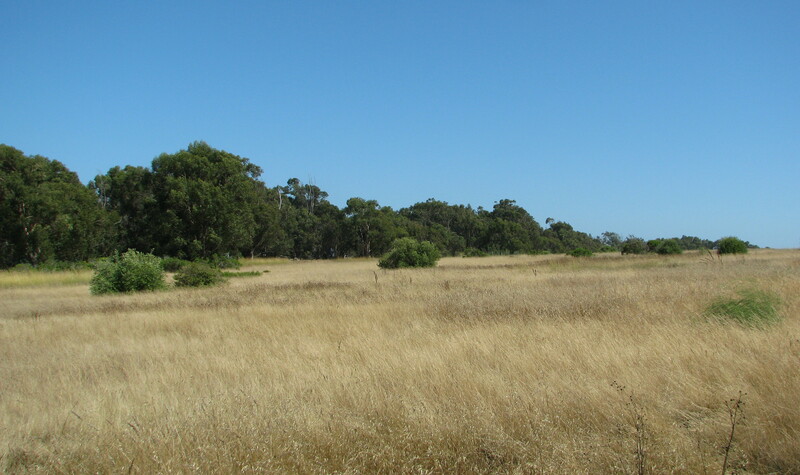 There is a trail that runs along the edge of the bluffs and one the traces the northern edge of the open space through the Eucalyptus Grove, where the Monarchs can be found, as well as a number of interconnecting trails that criss crossing the area. From the bluffs take one of the trails back down to the beach and return to Coal Oil Point. Regardless how far you hike you will have the opportunity to see some of the diversity of our coastal settings. This article originally appeared in section A of the July 16th, 2011 edition of the Santa Barbara News-Press.